On behalf everyone at SIDEBURNS Magazine, I wish to congratulate Norm Ackland Sr. on his 50th Anniversary as Canada’s first ETA. A celebration to mark the event recently took place in London, Ontario. Thank you to Darlene Martin for contacting her nephew, Norm Ackland, who sent along photos and the following bio of his father to post. And thank you to Norm Sr. for the subsequent photos of the celebration. Best regards, Carolyn MacArthur. Norm Ackland, aka Midnight Elvis, lives in London Ont. He is the first ETA in Canada, since 1968, and also has the distinction of being part of the only three generation family of ETAs in Canada. His son, Norm Jr., since 1980, and grandson, Jax, since 2010, complete this highly talented trio. The 50+ Club's Original Legends: ETAs Johnny Harra 1959, Pete Wilcox 1963, Wade Cummins 1964, and Norm Ackland 1968. Norm Sr. has performed in over 700 shows with highlights including a performance at the Las Vegas Hilton and recording at Sun Records. 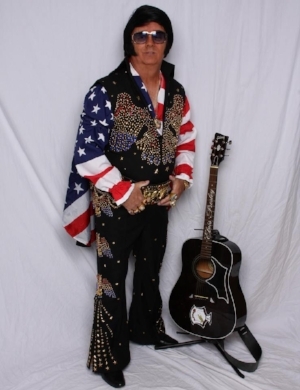 He has amassed over 90 Elvis rings, 50 necklaces, and over 30 outfits in order to give his audience the most authentic Elvis experience possible. Norm was fortunate to have seen Elvis perform twice after winning tickets from CJBK and CKSL. He is also known for being the co-creator of the Crib Wars board game. As he celebrates his 50th anniversary as an ETA, Midnight Elvis would like to invite his family, friends, and fans to a special charity event. On Saturday, May 19th, 2018, Midnight Elvis will be hosting two afternoon shows, and one in the evening, which will take place at the Royal Canadian Legion - Victory Branch 317 at 311 Oakland Ave. Admission is free, but Midnight Elvis requests that you help him support the three charities that are close to his heart. Non-perishable canned goods will be accepted on behalf of the London Food Bank. Cash donations will be greatly appreciated in support of Autism Ontario- London Chapter and the Victory Branch Legion. The photos in the carousel are from Norm Ackland Sr.'s 50th Anniversary celebration as an ETA. A Request from Norm Ackland Sr. This year is my 50th anniversary as the first ETA in Canada. Throughout the years I have performed at hundreds of charity events. 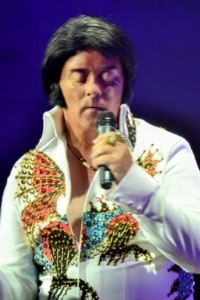 My goal is to make my 50th anniversary celebration a fun time while contributing as much as possible to the charities which are closest to my heart, so there will be my other tribute artists in the shows. I’m asking the media to help me achieve my goal by publicising this event. Any support you can offer would be greatly appreciated.